conditioned to see a thick green lawn as a beautiful thing and it is. Some of us tend to be a bit lazy in the gardening department and see that thick green turf, as just a long list of maintenance jobs. 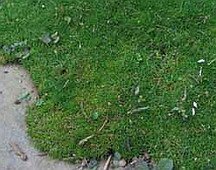 Some of us have areas in our gardens where grass simply won’t grow or where no lawn mower can reasonably be asked to go. Great reasons to consider alternate ground covers. Yes, asphalt is an alternative ground cover but this is a gardening web site. Actually quite a wide variety of plants, that are low growing, form a dense cover and withstand some traffic, are readily available to use as groundcovers. 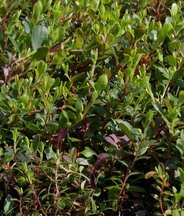 The native Bearberry, Arctostaphylos uva-ursi is a trailing evergreen shrub that will grow in some rather difficult circumstances; including poor soils and full sun. 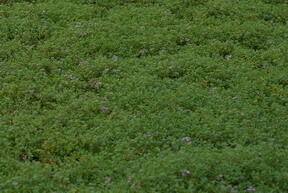 Several of the Thymes, such as creeping thyme Thymus serpyllum and Wooly Thyme, Thymus pseudolanuginosus are quite low growing, dense and will withstand a fair amount of traffic making them ideal groundcovers and with some of these you have the added advantage of readily available thyme for your kitchen. Scotch moss, Sagina subulata is not really a moss but its bright green mats of tiny foliage certainly look like one. It will also grow in sunnier areas then any moss will and will withstand some foot traffic. Irish moss, Arenaria verna is nearly identical and they can only be differentiated by their flowering habit. Both have tiny white flowers that indicate that are truly not real moss, which does not flower. 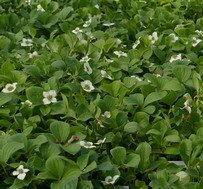 In shady areas there are several other choices for groundcovers, such as the native Bunchberry, Cornus canadensis which has larger bright green leaves and white flowers. The widely used Periwinkle, Vinca minor is a robust rather tall growing, vine like plant, that bears blue flowers that give it, its common name. It is not particularly neat and is best used in a semi-wild area. Not useful for any traffic areas. There are many more plants that can act as living groundcovers and I would have to finish that book to give you all of that information. Check out what’s available at your local garden centre. There are several key factors to consider when choosing a vegetative ground cover, as opposed to gravel or asphalt. Sun or shade? Amount of foot traffic? Soil type and moisture? Appearance, wild and rambly or neat and tidy? Maintenance regime? Cost? When you have answered all of these questions then your choice of ground cover plant will become much more limited but you should wind up with something that satisfies you. It is possible to go through this exercise and discover that turf grass is actually the best choice for your area. The kids cannot play soccer on Wooly Thyme. There are several choices in turf grasses that can make it a more, ‘lazy gardener,’ friendly, alternative. That’s another article coming soon. Very few of the groundcover plants are available as seeds. You will probably have to buy small pots of plants. This can be very expensive if you want to cover a large area. Look for landscapers that will sell you whole flats of plants. Most of these plants propagate and spread quite readily. Even a 4" /10 cm pot can usually be subdivided into several smaller pieces when you are planting them out. The really frugal method is to find friends and neighbours who have large patches of it growing. They will usually let you trim it or take plugs out of it and these pieces will rapidly fill in your space. As in all gardening projects it is a “time vs money” balance. The more of one you have to give; the less of the other will be required.